Gus and Claire Gordon recently appeared in the romantic comedy/drama, LOVE LETTERS, by A.R. Gurney. The show, which was staged by Phil Funkenbusch, was presented at Lincoln's New Salem on Saturday, February 17 and Sunday, February 18. Claire and Gus will also be performing the show in Jacksonville for the Jacksonville Theatre Guild on Friday, March 9 and Saturday, March 10 at 8:00pm, and Sunday, March 11 at 2:00pm. In this wry and poignant tale told entirely through letters, A.R. Gurney has created an exquisite jewel of a play "one of the four or five best American plays of the 80's. "-William A. Henry III, Time. From their first scrawled valentines of childhood, to the last guilty goodbyes, Melissa Gardner and Andrew Makepeace Ladd III's letters envelop us in a unique nostalgia. While the images they create bring back youth's universal innocence, fears and fancies, they further reveal themselves, their goals and their dreams in a "love affair" that takes them from grade school through middle age. And as they ponder opportunity lost and love squandered, we see the very essence of their life-long relationship...all in the letters that were at it's very root. 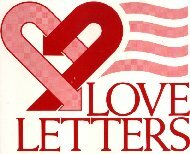 "Gurney's virtues...civility, elegance, wit and charm...have seldom been better displayed than they are in LOVE LETTERS. "-Howard Kissel, New York Daily News. "Few plays have been tinier, or more beautiful than this tender sketch of the bond between two people who cannot live with, or without, each other." - William A. Henry III, Time. Claire Gordon (Melissa Gardner) Claire returned to the stage in THE CHRISTMAS SONGBOOK after a five-year absence (during which time she gave birth to Amy, age 4, and John, age 1, and helped get Gordon Productions off the ground). In Springfield, Claire has appeared in the title role in SUGAR and as Rapunzel in INTO THE WOODS, at The Muni (both times playing opposite her favorite leading man, husband Gus!) and as Audrey in LITTLE SHOP OF HORRORS, Frenchy in GREASE, and Catherine in THE FOREIGNER at Springfield Theatre Centre. Other favorite roles include Marian in THE MUSIC MAN, Arlene in BABY, and Patty in YOU'RE A GOOD MAN, CHARLIE BROWN, all in Cincinnati, Ohio. Professionally, Claire has performed with Riders in the Sky on the National Public Radio show Riders' Radio Theater. Claire is a professor of speech at Lincoln Land Community College, where she has directed several plays and serves as faculty advisor to the LLCC Theatre Club. Gus Gordon (Andrew Makepeace Ladd III) Gus is best known across central Illinois as the Chief Meteorologist for NewsChannel 20. Over the past ten years, he has performed at Muni, Springfield Theatre Centre, New Salem, Lincoln Land Community College and The Little Theatre on the Square. His favorite roles include: Harold Hill in THE MUSIC MAN, Richard Henry Lee in 1776, Bobby Child in CRAZY FOR YOU, Stine in CITY OF ANGELS, Rapunzel's Prince in INTO THE WOODS, Bill Snibson in ME AND MY GIRL, Joe in SUGAR, the Dentist in LITTLE SHOP OF HORRORS, and Frankie in FOREVER PLAID. He has twice been named Best Actor by both The State Journal-Register and The Illinois Times and just recently was honored by the Decatur Herald & Review for his performance in SHE LOVES ME at The Little Theatre on the Square. 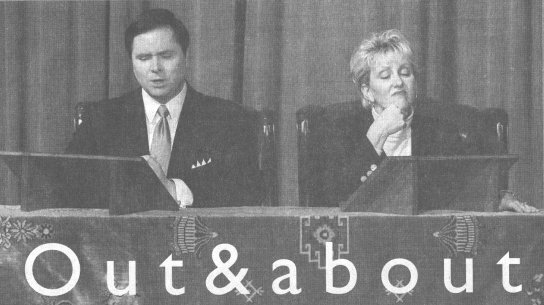 Gus and his wife Claire are founders of Gordon Productions, a local theatrical production company, and have produced GREATER TUNA, FOREVER PLAID and THE CHRISTMAS SONGBOOK. They are also the proud "producers" of Amy and John.